A multi-language complete reference to the Holy Quran with exegesis and basic tajweed guide. It also provides with translations and summary of every chapter and juz in different languages. A WordPress plugin for institutions providing online education. It enables you to display your course/media library in tabular form without the effort of custom creating html tables & layout. A WordPress plugin for institutions/organizations to easily organize their course materials, FAQs, Fatawa into Groups, Categories, Tabs & Accordions. 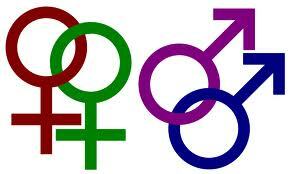 God never loves homosexuality. In Holy Quran and Bible, God has discussed about the people who were indulge in this great sin and Prophet Lot (Peace Be Upon Him) was sent towards them for their guidance, but due to their arrogant and ignorant attitude God cursed them all except few who were the righteous, saved. 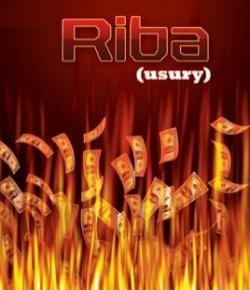 Interest of Usury is very common these days. In life we have to face it at every turn. Whether they are business transactions or loan payments; borrowing house or car on lease, seeking of loans from the bank or using credit card for shopping, Interest at every turn has somehow created relationship and is connected to our lives. Few days ago a Muslim country's government launched a new scheme for the welfare of their youth, through which youngsters can easily start their new business. But unfortunately the government has adopted interest of usury in this loan scheme also and has forced the youngsters into the menace of this interest. In this era where there is lot of misunderstanding about Islam, there is also lack of Islamic knowledge. 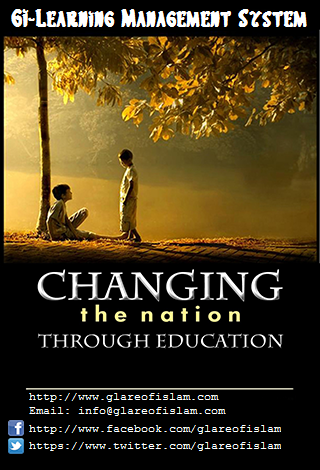 Islamic education provides a vital role to overcome these global issues. Many institutions are willing to provide online education but due to lack of expenses and IT expert staff they lack to meet the International standard for online education. Glare of Islam is a non-profit Islamic organization providing IT services to Islamic institutions from past 4 years in web, software and mobile application development. After successfully launching our 2 softwares GI-Quran Reference and GI-Media Library, we are now in the process of launching another web application named GI-Learning Management System. 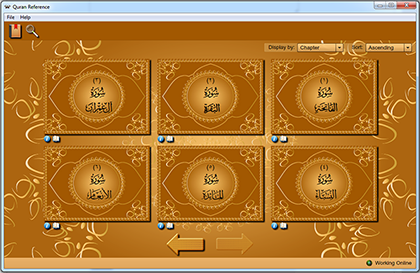 GI-Quran Reference was our first application launched in 2008 as a web application. It's design was based on Islamic Art and Calligraphy. It's a complete reference to the Holy Quran with different recitations, exegesis, translations, tajweed guide & rules, bookmarks and search feature. After various feedback from our users, we have released its desktop version. With desktop version it was easy for users to listen and learn Holy Quran without the Internet, plus it includes additional feature, Summary of every Chapter and Juz. GI-Media Library is a WordPress plugin which provides basic feature to create online course/media library for students. This plugin was very successful and is also listed on WordPress official site at http://wordpress.org/plugins/gi-media-library. After getting positive response from our clients, we have decided to extend this plugin to fully support all the requirements of LMS (Learning Management System). This is from where we have decided to develop another plugin with name GI-Learning Management System. After developing these features, we have planned to extend it further to include Examination and Quiz system also. All of these features will be developed to support multilingual. This application will also be a free plugin for WordPress, which can be easily downloaded from WordPress.org. We are willing to provide this plugin free of cost to all the Islamic institutions and for this we need your support in development of this new application. The estimated cost of development is $3000, with an estimated completion time period of 2 months. May Allah accept your contribution and grant you the best here and hereafter. Amen.